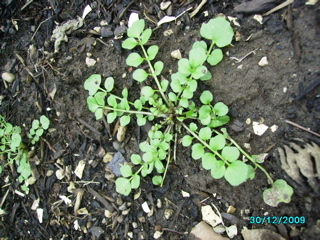 Not a weed, a salad green! Hello and welcome to my first blog post for Cook With What You Have! I was playing outside with my three-year old the other day and he was digging in an empty garden bed on an unseasonably warm January day. 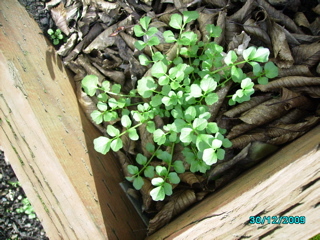 I noticed that the raised bed’s edges were alive with the bright green little cress (actually called Hairy Bittercress and related to the commercially available watercress) that is always my first sign that winter is slowly on the wane. I’ve used this delicate, peppery green in salads for years despite its unpalatable name, which I just learned today. I think it’s mostly known to farmers and is a weedy nuisance but to city dwellers with little else edible growing at the moment, it’s a fun treat. So look around your house and yard and see what you find. pull up the whole plant, wash well and then add it to a salad, a sandwich or quesadilla and enjoy.